As the oldest of six girls, having two boys has become an everyday adventure with daily events that I never could have imagined. Then my sister Ashley had two boys of her own. My sister Lindsey and her husband Brandon are expecting a baby at the end of September and they are having a GIRL!!! I don't think anyone is quite as excited as my youngest sister Molly though. 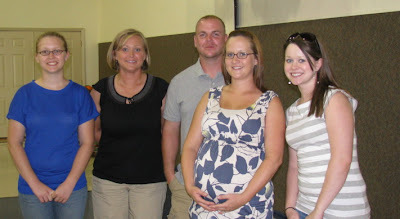 Earlier this month, I helped my two youngest sisters host a shower for Lindsey and Brandon. I think it's gotten to the point where I am expected to give scrapbooks as gifts, so I was happy to make a 6x6 album for their "first photos" of the baby. And finally...the end. On the way out the door to the shower, I realized we'd need a notebook to record the gifts. Well...I had scraps left over from the album, so I grabbed a mini composition notebook I had and altered it with the scraps. I finished it off with a cute little pacifier charm. Now the countdown is on until we get to meet Reese Adeline. Amy that is exciting, I don't have any sisters, but often wish I did. How exciting for you all! And the album is just adorable! Great job! That is so cute Amy!! I bet she loved it! 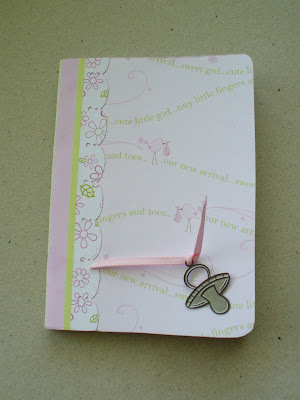 Love the album and the mini you just put together on your way out the door - too cute! Love that little pacifier! What a sweet gift for baby Reese! Our family was just the opposite--we had four girls, then the first four grandchildren were girls. So the first BOY was a big deal. Now out of 19 grandchildren 10 are boys and 9 are girls. The last five have been boys!